SHYBOY formed in June of 1988 and quickly gained a solid following on the local club circuit. 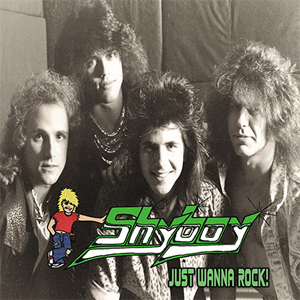 Through their hair band ballads and extremely melodic rock tunes, SHYBOY was constantly booked at notable New Jersey clubs like Studio One, Murphy’s Law, and the Playpen. As their popularity grew, they were asked to open for national acts like WARRANT, TRIXTER, ROXX GANG, AMERICAN ANGEL, and THE RED AND BLACK featuring members of BLUE OYSTER CULT. The band is made up of Marc Gulli (guitars), Ray Santini (bass), Chris Oremus (Vocals), and Bobby Lambert (drums). The band released their first recording in September of 1988; it was called Stop-N-Go which featured the title track “Stop-N-Go”, and the power ballad “Don’t Walk Away”. In 2018, SHYBOY signed with FnA Records. FnA Records had the Stop-N-Go indie album remastered from the original tapes. Additionally, guitarist Marc Gulli supplied the label with 4 never before released tracks which appear on this renamed album version entitled Just Wanna Rock. Lastly, Marc supplied a live show which includes tracks that had never been recorded in any manner. Due to the length of this album, the cover of TRIUMPH’s "Magic Power" had to be left off. SHYBOY continued to play out relentlessly through June of 1990 when they decided to call it a day. The band had the time of their lives creating sing-a-long melodic tunes that the fans could sing to. The obligatory ballad or two also grace the Just Wanna Rock album. The band is excited for the fans to hear the new tunes and the remastered versions of the songs. This CD is silver pressed. It is available on CD for $14.97, and digital download for $9.97. Autographed Fan Packs will be available as well. Check out the SHYBOY album teaser below.